Welcome to another edition of our Famous Bugs series! In this post, we’ll cover the PayPal bug that we really wish happened to us. 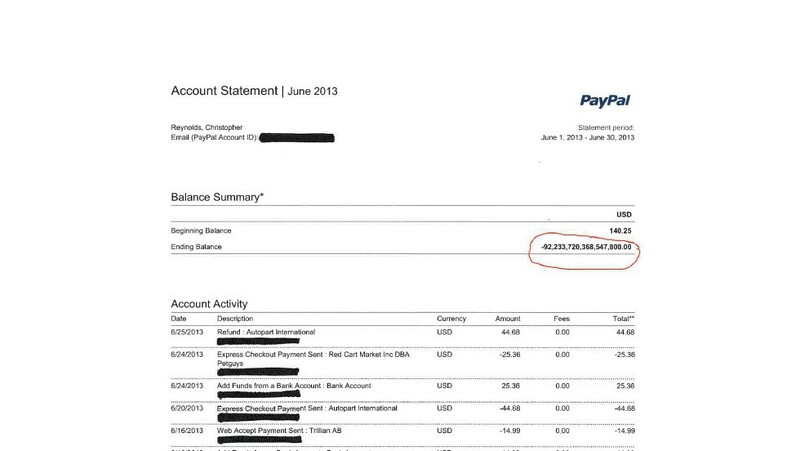 When Chris Reynolds opened his PayPal e-mail statement for June 2013, he realized something wasn’t right. The Pennsylvania PR executive’s balance blew up to an incomprehensible $92,233,720,368,547,800. For everyone out there struggling to read this number, that’s 92 QUADRILLION dollars and change. This new account balance would make Reynolds the richest man in like, the history of money. In fact, it would make him about a million times richer than telecom mogul Carlos Slim, the richest man in the world who is worth 67 billion dollars. Actually, Reynolds’ balance was a thousand times greater than the GDP of the entire world. Not too shabby for a man who made most of his PayPal money selling vintage BMW tires. Reality finally kicked in and his account balance was restored to $0, the correct amount. PayPal did admit the error and offered to make an unspecified donation to any charity of Mr. Reynolds’ choosing. His reign as the world’s first quadrillionaire didn’t last long, but how many people can say that their account balance hit 19 digits? Reynolds did, however, reveal the philanthropic side of a true quadrillionaire, confessing that he would’ve used the money to pay off the country’s national debt. P.S : For those of you wondering about the amount, it’s the maximum value for a 64-bit signed integer. Well, the exact value is 9,223,372,036,854,775,807 but the number was apparently rounded up. BUGS CAN BE COSTLY AND SOMETIMES THEY CAN BE AS COSTLY AS ANYTHING THE UNIVERSE HAS EVER SEEN. LET US KNOW IF WE CAN HELP YOU OUT WITH ANY BUGS GETTING THE BEST OF YOU!